ICanToo - 100% Cotton Split Neck 3/4 Sleeve Seafolly Tunic Seafolly. Cotton Blouse Top Shirt. With wonderful light weight, bright and breezy 100% gauze fabric, these 100% Cotton Tops will bring the joy of the seaside to you. A longer length gives a flattering look, and the Split Neck is a timeless style that makes your torso look longer. The subtle A-line will give you comfort in movement and will take you everywhere in style. Women's sizes in S, M, L, XL, 2XL. Be sure to See details in Size Chart. Made in USA. 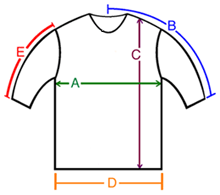 A: Chest / Bust circumference 40" 42" 45" 49"
B: Sleeve length from center of neck to end of sleeve 27" 28" 30" 30"
C: Body length from shoulder to bottom of hem 27.5" 27.5" 29" 29"
D: Hem circumference 43" 46" 47" 51"
E: Sleeve length from shoulder to end of sleeve 19" 19" 20" 20"